Last December I wrote a post saying that I was going to sell my Harley-Davidson Ultra Classic now that I had it running perfectly. And last Saturday I got it done. It was kinda sad seeing the Ultra riding away with someone else. But, it's now just another chapter in my motorcycle life. I wasted no time and hit up Craigslist looking for a Honda ST1300. I ran a search for "ST1300", and wouldn't you know it nothing I liked came up. What I had seen a month ago were now all gone. There were still a few up in Los Angeles, but too old or too many miles on them. Then it hit me, I tried adding a space between the ST and the 1300 and searched for "ST 1300". 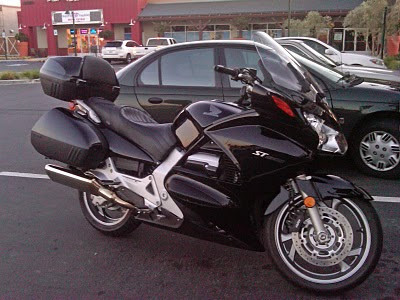 That's when this black 2006 Honda ST1300 popped up, with only 7,000 miles on it, and not all that far away. I called the guy, and made arrangements to look at it. I brought cash with me just in case. It was beautiful. The owner had bought the trunk separately, which is an actual Honda trunk, but is only sold in Europe. I guess Honda doesn't want too much competition for its Goldwing. He also had two seats, the Corbin pictured above, and the stock seat. Also handlebar risers, which puts me in a more comfortable position. It was the bike I had wanted, and the color I wanted, with low miles, some good accessories, how could I not want this? So I ended up riding her home Monday. This afternoon I spent the day getting stuff done. I had a locksmith make extra keys for me. I called my insurance guy and added the ST to my policy, and took the Harley off. Then I went to the DMV to get it registered. I got there early, thinking I was going to beat the crowd. Wrong! Massive line out the door. Cars fighting for parking. People waiting for driving tests. People sitting on the curb outside the building waiting to hear their number called over the loudspeaker. I didn't bother getting off my bike. I don't have Triple A so I can't go there. But I ended up going to one of those little vehicle registration agencies at a strip mall near my home. I was pleased to see no lines. I walked right up, and they got it done for me, but I had to pay an extra $29.00 for their services. So I had an opportunity to ride it around today and get a good feel for it. I took the trunk off just to dump some extra weight. I didn't go on any twisties today, but did spend time doing some u-turns and slow-speed maneuvering. It handles really well. The steering is very light. I practiced shifting through the gears more smoothly, practiced braking, practiced starting from stop. I also tried sitting up close to the tank versus sitting further back on the seat, just to see what felt better. Congratulations. Getting a new bike is always fun. Apart from including the space, your search and find for new ride seemed really simple. The key to this? - knowing what you want I guess! As you said, how could you say no. Have fun with your new ride. Actually Gary, I've been wanting a sport tourer for a few years now, and had plenty of time to read about them. It was all just a matter of selling the Harley. Buying the ST was a snap. BTW, when you come to Southern California, I'd love to hear about your travels. Great bike. I think that would be so cool. Let us know how it does on a trip. No matter where your riding takes you—cross-town or cross-country—you won’t find a better sport-touring motorcycle. Are Poker Runs Getting Shorter?